Entrance Exams AIIMS PG RESULT 2019 FOR JAN SESSION TO BE ANNOUNCED; KNOW HOW TO CHECK FROM HERE! AIIMS PG RESULT 2019 FOR JAN SESSION TO BE ANNOUNCED; KNOW HOW TO CHECK FROM HERE! 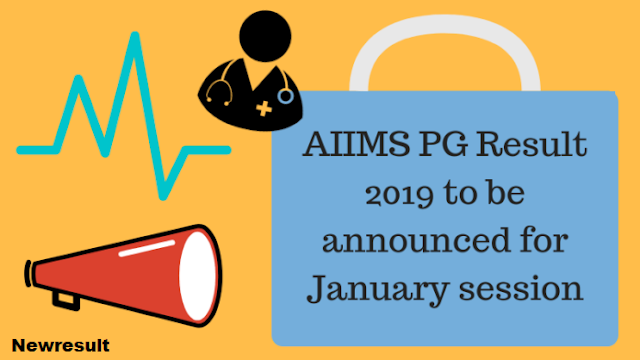 The All India Institute of Medical Sciences (AIIMS), New Delhi, is going to announce the AIIMS PG Result for January 2019 Session. The entrance exam for AIIMS PG (MD, MS, M.Ch, DM, MDS) was held on November 18, 2018, in Online mode. The candidates will be able to check their result for AIIMS PG Jan 2019 online at the website, aiimsexams.org. The candidates can check their AIIMS PG 2019 Result by visiting the official website of AIIMS, New Delhi. On visiting the official website, click on the Academic Courses tab. Then click on the link for the PG courses. Now, click on the left side of the page, click on the link which says “Registration/ Login”. Enter details such as Registration ID and Password. Click on the “Login” button to submit the details and your result will be available on the screen. To qualify the AIIMS PG 2019 entrance examination, one needs to obtain a minimum cut off percentile set by the Institute. The minimum cut-off necessary in the Entrance Examination to determine eligibility for admission is 50th Percentile. The Percentile scores are scores based on the relative performance of all those who appear for the entrance examination. On the basis of the candidate’s performance in the entrance examination, a merit list will be prepared. Two types of merit list will be prepared which are Overall and Category-wise merit Lists which will be published online. Those who will qualify the AIIMS PG 2019 examination will then have to appear for the AIIMS PG 2019 Counseling round. Such candidates will be required to report to the counseling venue with a list of important documents, along with their counseling call letters. This round for January session candidates will be conducted in the month of December, whereas for July session candidates will be conducted in the month of May. Candidates willing to pursue D.M./M.Ch/MD (Hospital Administration) course will be required to qualify for a written test(Stage 1) and then appear in the practical or lab test round(Stage 2). And for admission to MD / MS / M.Ch (6 years) / DM (6 years) / MDS course, a candidate will require to clear the entrance examination and meet the minimum marks requirement. All India Institute of Medical Sciences, New Delhi conducts AIIMS PG 2019 entrance examination in online mode for MD / MS / M.Ch (6 years) / DM (6 years) / MDS admission across its 7 campuses. This national level medical examination will be conducted for a duration of 3 hours for MD / MS course and for a duration of 90 minutes for MDS Course, covering all the important sections, studied in MBBS and BDS level, respectively. To know more about AIIMS PG 2019, Stay Tuned with NewresultNews!